Prague, November 29, 2018 - December 17, 2018 will be exactly eighty years from the first edition of the Rapids Arrow comic in the Young Broadcaster magazine. The round anniversary marks the week of the publication of the Quick Arrow Poster with twelve quality large-format reproductions of selected stories by writer Jaroslav Foglar and illustrator Jan Fischer - among others, there are, for example, Black Riders or Dlouhá Bidlo looking for a cat. Posters of A2 size, which are printed with special technology including letter notes, have also been embedded by Albatros in cardboard plates tied with a canvas. You will be able to buy Rapid Arrows in bookstores or e-shop publishers at www.albatrosmedia.cz. "With the idea came Peter Elias of Albatross. The selection of stories was narrowed because most of the Fischer-drawn Quick Arrows were black and white in the original, so we had to come out only from a limited color spectrum, "says Roman Šantora from the Jaroslav Foglar Scouting Foundation. "We've been trying to bring both funny stuff and learning and adventure to make it a varied mix," explains Shantora. Grafik Martin Pecina cleansed carefully and at the same time very delicately all the parts and tuned in color to get as close as possible to the original. "Then we selected the pieces to be printed and printed directly to the originals, and according to Martin's result, the colorfulness was still good," adds Šantora. In addition, the printing process was performed with a special technology that invisible raster and highlight color, so the result is almost comparable to the original. Additionally, the posters are accompanied by an extensive record of the production of the series in the past with examples and beautiful embossed boards and canvas back. The posters can be seen at the exhibition in the cafe of the Scout Institute in Prague, where they will hang up until December 17th. At the same time, it is possible to purchase two posters separately. The exhibition is part of the Moon with Quick Arrows, where there is a reading from the shadow trilogy every Sunday from 14 to 15h (eg traveler and writer Ladislav Zibura, actors from the Theater in Dlouhý Jan Meduna and Pavel Neškudla and others), visitors can join to the search game We are looking for fast arrows or a birthday challenge to help scouts who have lost their clubhouse. The events are part of the #RokRychlychSipu - 80th anniversary celebration since the first edition, more info at www.rychlesipy80.cz or www.skautskanadace.cz . The mission of the Jaroslav Foglar Scout Foundation is to support out-of-school education and education of children and youth in the spirit of scouting ideals. The Foundation was founded in 2002 and has been supporting the activities of Scout organizations and groups since its inception. It contributes in particular to the purchase and repair of scout clubs, campsites and other real estate. Its activities are funded by donations from individuals and companies. A special and deeply valued resource is the legacy of the leaving scouts. The most famous of them is the legacy after the scout leader and writer Jaroslav Foglar. The fast arrows are the name of the five-boy club from the books and comics of the writer Jaroslav Foglar. 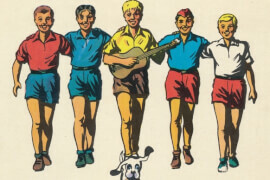 Members of the club were Mirek Dušín, Jarka Metelka, Jindra Hojer, Červenáček and Rychlonožka, their club dog was Bublina and after him Kuliferda. The rapid arrows originally appeared as a comic book in the magazine Mladý Hlasatel, since December 17, 1938. While the author of the text was always Jaroslav Foglar, Jan Fischer was drawing the first series, Marko Čermák drew the second series (period around Prague Spring). Bohumir Cermak and Václav Junek performed some parts. Jaroslav Foglar also transferred Rapid Arrows to the book trilogy Mystery Mystery, Stunts with Storm and The Secret of Great Vonta.